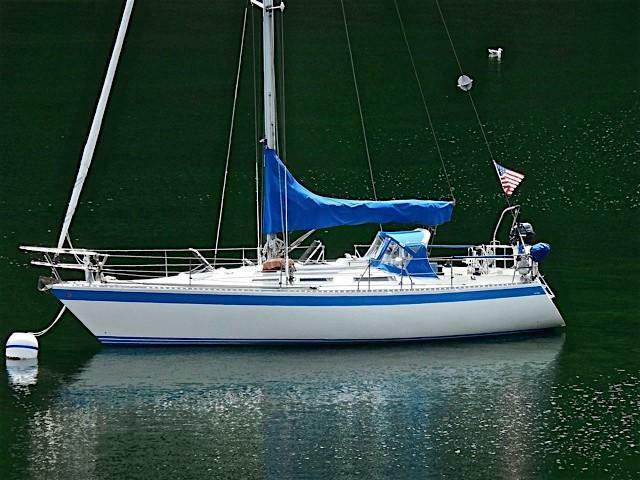 Looking for an honest cruising sailboat? If so, this 1982 Wauquiez Pretorien 35 merits your consideration. "Aeolus" ' sports a deep cockpit for protection and safety at sea, along with an outfit and layout for easy shorthanded sailing. Offering two double staterooms plus salon and dinette berths for 3, she's beautifully finished in teak joinery and paneling in the Wauquiez tradition, with headroom of 6'-6'2" and newer durable upholstery in green. Sleeps up to (4) owners/guests in two staterooms plus two dinette and one settee/lee berth for a total of (7) berths. The MASTER STATEROOM is forward, offering double V-berths with custom fit 12-inch thick interspring mattress; opening overhead hatch; hanging locker to port; privacy door aft; and private access to the ENCLOSED HEAD next aft to starboard with integral shower. General access to the head is from the forward companionway; large hanging locker and cabinet storage is opposite on port. Next aft in the MAIN SALON is a large U-shaped convertible DINETTE, with pull-out leaf extending to the large, single-berth sized settee on port with built-in bookcase over. Next aft to port is the roomy NAVIGATION STATION, with chart table and easily accessible overhead electronics. Opposite the nav station is the U-shaped GALLEY to starboard, featuring pretty and practical ceramic tile countertops and durable round stainless steel sinks. Finally aft to port is the well-planned AFT CABIN, with standing headroom at the entrance, a built-in seat and locker outboard, and a double quarter berth. Centerline steps between the gally and nav station lead up to the large and sheltered COCKPIT. INTERIOR aboard "Aeolus"' is in excellent condition, featuring the signature top-quality Wauquiez teak paneling and joinery; cabin sole is teak & holly. NOTE: Wallas forced air diesel cabin heat; manual head plumbed to holding tank with pump out. HEADROOM reaches approximately 6'2". Comfortable aft GALLEY features the distinctive Wauquiez ceramic tile countertops in terra-cotta color; dual round stainless steel sinks; pressure freshwater system featuring both a Whalegusher hand pump and an electric pump in line with a 5 micro water filtration system; propane solenoid and propane sniffer; and ample cabinet and drawer stowage spaces for dishwares and storage. 12vDC and 110vAC systems with fuse/circuit breaker protection; (2) house batterys and 1 starting battery (approximately 400 amp hours total) divided into two separate banks; battery charger; inline splitter from the alternator directing charge to whichever battery banks needs it most; 30-amp dockside electrical inlet with 50' hook-up cable; dockside. DECKS are fiberglass with non-skid; stainless bow rails; stainless stanchions with lifelines; navigation lights; fenders & lines; life jacket(s); stainless steel BBQ mounted on stern rail; Lifesling.